Silt vs clay. To most people, these two types of soil look very similar. It is more like comparing soil versus dirt. It can be hard to differentiate one from the other. For one, both are considered fine grained. As a gardener, you need to know which soil is silt and which one is clay as it can make a big impact on plant growth. There are basic facts that can help you in identifying silt vs clay. Soil is considered clay when it has clay minerals, the most common of which are illite, kaolinite and montmorillonite. When there is a heavy concentration of clay minerals in the soil, it is classified as dense or heavy soil. Clay soil is composed of particles that are cohesive and with flake-like structures. Although you cannot see them through the naked eye, they are visible using a powerful microscope. When clay soil dries, it can become as hard as concrete. That is why clay is commonly used for making pots and bricks as well as statues. Apart from that, clay has an important role in growing certain types of plants. Because clay has the finest soil particles, it is a known source of many chemical properties of soil. It is capable of retaining many plant nutrients such as magnesium, calcium and potassium. Clay also helps in stabilizing the humus in the soil. A soil without clay particles can be a very infertile soil. One of the disadvantages of clay in growing plants is that they tend to stick together so it is difficult to till. Root, water and air movement is also difficult especially in wet clay. Silt is fined-grained soil which may or may not contain organic matters. This type of soil typically contains particles of silica and quartz. One of the notable attributes of silt is that it has low permeability and water cannot easily pass through it. It is also moisture sensitive and a small amount of water can greatly affect its dry density. Moreover, the silt particles have a spherical shape and it gives you a slippery feeling when you rub it between your fingers when wet. 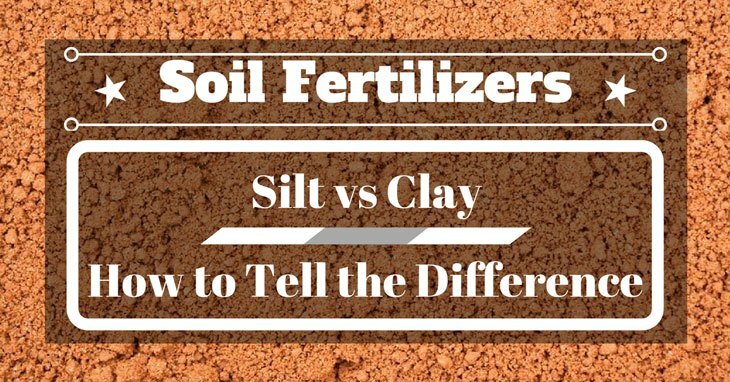 Unlike clay, silt does not perform well in retaining plant nutrients. On a positive note, it absorbs more water and readily releases it to the plants. Silt is also fertile and easy to cultivate. Because of these positive characteristics of silt, it is considered good for planting. Silt is prone to wind erosion and washing away if left without plant cover. You can improve its quality by adding organic matter that can readily bind with silt particles into more stable crumbs. Clay particles are smaller in size than silt. Clay particles are less than 0.002 mm in diameter while silt particles range from 0.002 to 0.05 mm. The plasticity of clay is more than that of silt. You can easily mold clay into pots and shapes but you cannot easily do that with silt. Clay is obviously richest in clay minerals than most soil types. Silt does not have clay minerals. Silt is smooth, slippery and soapy to touch when wet. Clay is plastic-like and sticky when wet. Clay is tougher than silt. When clay soil is dried, it is as hard as concrete. Both clay and soil are fertile media for growing plants. However, these soils require some improvement to ‘unlock’ the nutrients for plants to use. One way to do it is to add organic composts to the soil to allow for more permeability and root movement. Most plants that can grow in clay soil also thrive in silts. Among them are trees like the acer, crab apple, magnolia, laburnum, and sorbus. There are also many types of shrubs that grow in both soils such as the camelia, lilac, mahonia, berberis, rose, and sambucus. Popular perennials such as hosta, solidago, foxglove, bluebells, and delipendula also grow in both types of soil. Identifying silt vs clay is possible even with hand analysis. If correctly executed, you can rapidly assess and determine the type of soil your plot has. These hand tests are easy and inexpensive. I found a good article at Civilblog.org which lists down four hand analyses for identifying soil versus clay. In this test, you need to mold a small amount of soil and allow it to dry in the air. Try to press a fragment of the dried soil (about 1.0 cm in size) between your thumb and forefinger. If it crushes easily, it is silt. If it takes you extra effort to crush the soil, it is clay. I find this process hard to explain here. Instead, I found a video showing how to do a dilatancy test. When you tap the soil and it gives a glistening appearance, it is silt. If the soil pat appears to be deformed, it is clay. In this test, you will need a sample of moist soil and try to roll it into a long thread with a diameter of about 3mm. If you are able to achieve it, the soil is clay. On the other hand, silt will have severe cracking in the process. Get a small amount of soil and put it inside a glass cylinder. Leave it for the soil to settle. Silt normally settles in 15 to 60 minutes. Clay, on the other hand, will remain suspended for hours or even days. At first glance, it’s hard to tell if the soil is silt or clay. These soils have fine particles that you cannot easily identify unless you feel them with your hands. That is why hand tests are important for identification. By doing any of the hand tests we have listed above, you can differentiate silt vs clay. Did you find this article useful? Please share with us your thoughts about gardening using any of these soils. Don’t forget also to share this article with your friends who might find it useful.